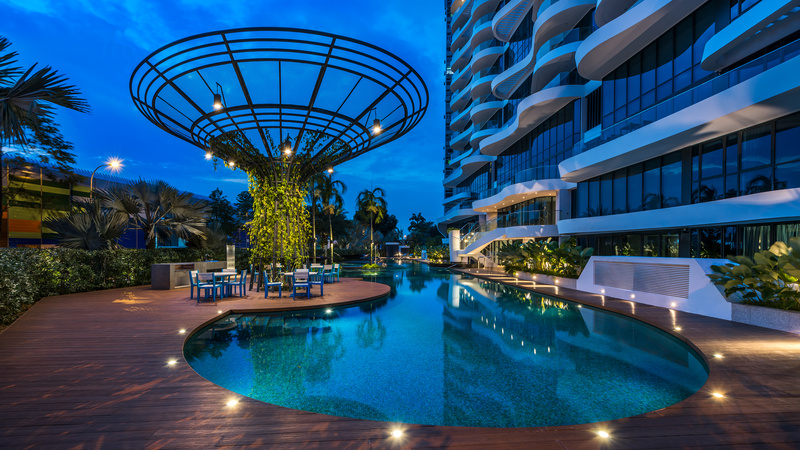 This multi-residential development is on the East Coast of Singapore, not far from the sea and the green recreational corridor which flanks the highway to Changi International Airport. The high density plot ratio and height limit were inherited from the previous building on the site. This demanded a large floorplate with a design which eventually provided six apartments per floor in a single tower. The challenge in all multi-residential design is how to minimise the sense of uniformity, animate the façade of the building and give some sense of individuality to the units. With Amber Skye, therefore, the challenge was how to create a massing which was dynamic and not too monolithic. The solution began with placing three units on either side of a central service corridor. 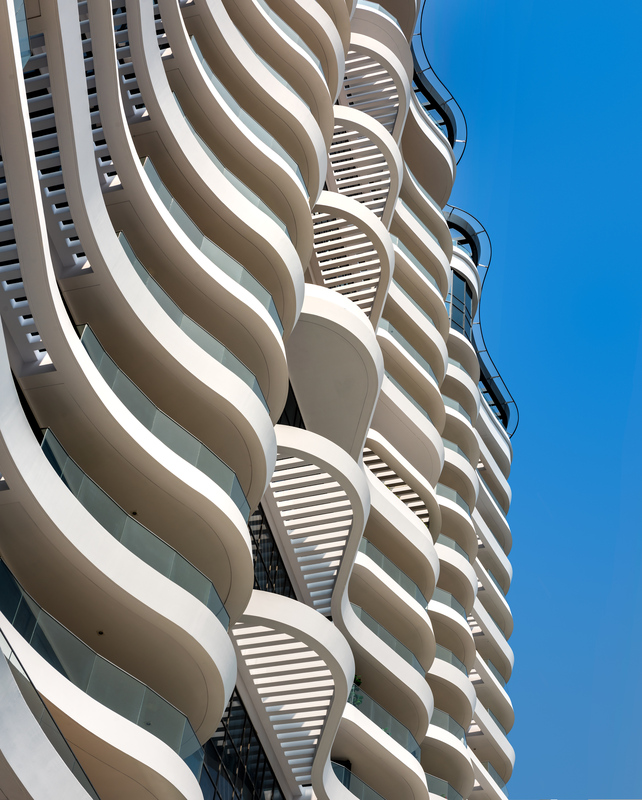 Each unit is basically orthogonal, but the corners are all rounded, a curvilinear character which is fully expressed on the façade of the building where the balconies form a wave pattern to pick up on the seaside location. 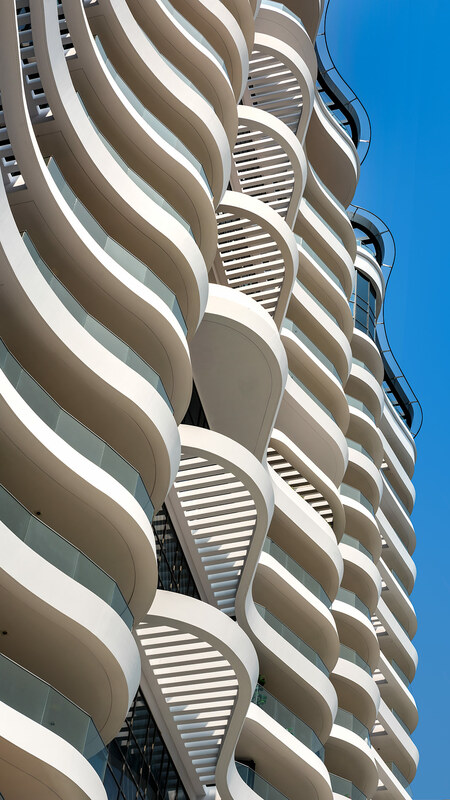 The balconies are also zig-zagged to amplify the dynamic form of the building’s outer form. This formal inventiveness also creates the illusion that each apartment is somehow autonomous and that each stack of apartments forms a separate tower, thus further breaking down the overall mass of the building. In addition to this trompe l’oeil effect, however, the waved form of the façade also generates additional natural light and ventilation. These strategies support the over-arching design intent which is to give the complex the character of a seaside resort ─ which itself was inspired by the close proximity to the ocean, conjuring up a sense of the endless rhythms of the sea and the ceaseless human activity which takes place in and around it. 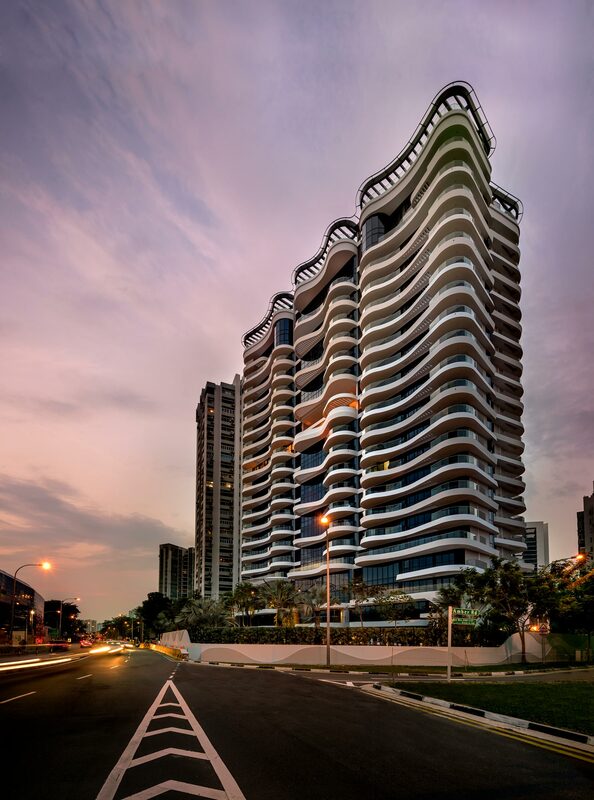 This begins at the ground floor where the entry is positioned as a semi-basement, allowing more space for the first floor villa units and common amenities which include a large curvaceous swimming pool, gym, playgrounds, the aqua lounge and lush landscaping which takes its cue from the wavy boundary wall to reflect the idea of a tropical seaside resort. 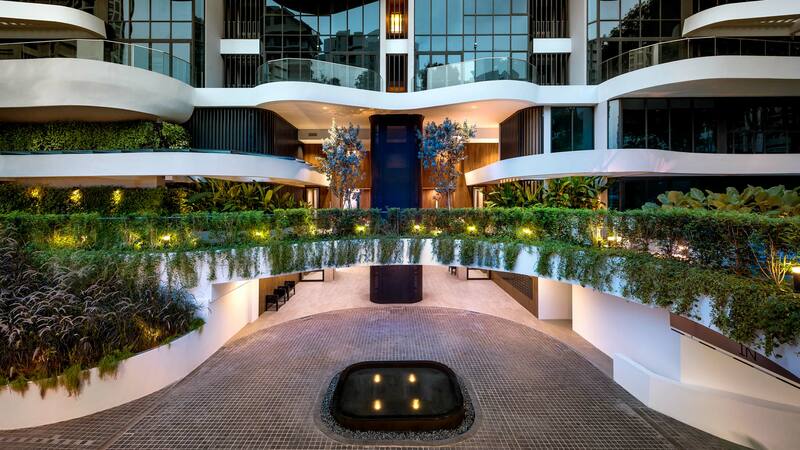 The combined effect of these amenities and the landscaping is to create a completed relaxed retreat from the hectic Singapore city centre less than fifteen minutes drive away. Individuality of experience, and the sense of being a part of an oceanside landscape, is further supported by the materials palette. The front apartments have a full-height window wall system using a pearl-tinted glass. This reflects the colours and changing cloud formations in the sky. At the same time, by ‘borrowing’ the colours and textures of the sky and sea, the façade of the building is lent its own special beige-grey colouring. 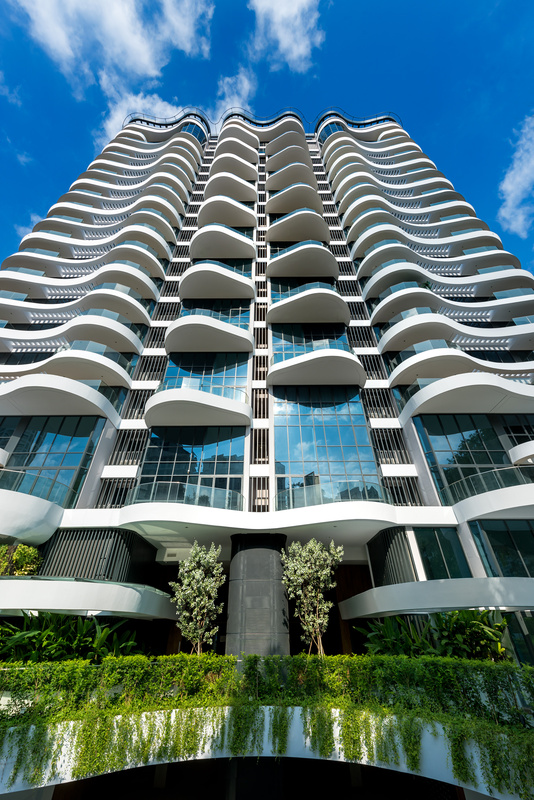 This is essentially an illusion of texture, but it adds to the actual texture of the façade ─ for example, the concrete balconies which are animated by a slightly grooved vertical patterning. These grooves contain the air-conditioning ledges. In tandem with the organically rounded louvres, this patterning also reinforces another illusion, namely that the building consists of three independent towers. The sense of individuality and privacy is further enhanced by the fact that each unit has its own private lift lobby. The first four floors of the complex ‘step out’ of the façade in a two-by-two arrangement which generates a terracing effect to give the building façade even more character. This also allows for a series of villa-like units which lends the lower floors of the establishment the feel of cluster bungalows, each with a generous floorplate, private carpark, large private garden and private swimming pool. Supporting the idea of a resort complex as well as the idea of a community rather than a collection of isolated units, is the sky terrace with its open dining experience and opportunity for socialising. The complex is completed by a set of three penthouses, each with a sky terrace and large swimming pool sheltered by a crown-trellis. From the siting of the building ─ natural light and generous outlooks for every apartment, together with views to the east, and western views of the city and the low-rise estates of Kallang ─ to the planning of the individual units, great emphasis was placed on efficient arrangement and what the architects refer to as “user-friendly experience”. All rooms, for example, have en suite bathrooms and the larger units are provided with wet and dry kitchens. And sustaining the aim of generating a mood of uniqueness and individuality, there is a diversity of apartment types, from the villa units on the lower floors, through the apartments to the penthouses at the top of the property. True to MDL’s philosophy, Amber Skye is more than just a building. 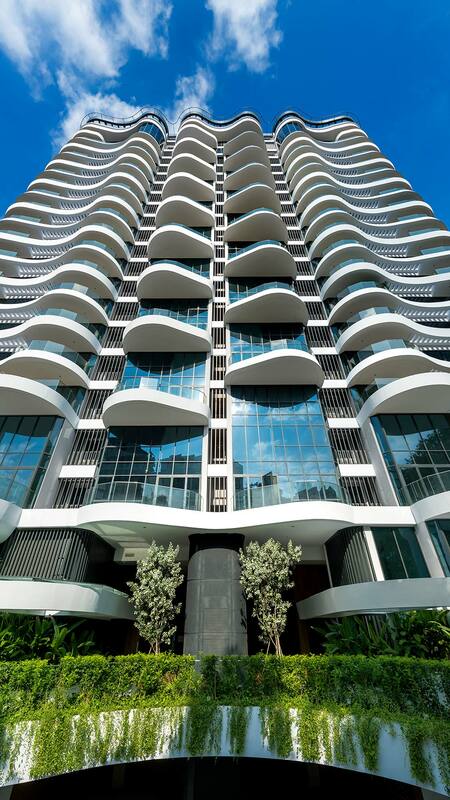 On the one hand, it is an elegant and stimulating addition to its urban setting. On the other, it is an embodiment of certain values " ─ in this case, the celebration of quality living, both individually and as a community.